"With its mixture of grimy reality, nostalgia for 1970s New York and a throbbing rock 'n' roll soundtrack, the new @hbo drama @vinyl feels like a @martinscorsese_ movie. Which makes sense: The filmmaker, who directed the 2-hour pilot episode, is an executive producer of the series — alongside @mickjagger. With a cast that includes @oliviawilde and an aesthetic that mixes fictional characters with actors playing real-life music stars, the series is ambitious and expensive. To its creative team, it also seems like a sure thing. "I remember pitching it to myself and going, 'All right: Martin Scorsese. Mick Jagger. Rock 'n' roll. I don't care what it is — there's no way I wouldn't watch this,'" said Terence Winter, the show runner. 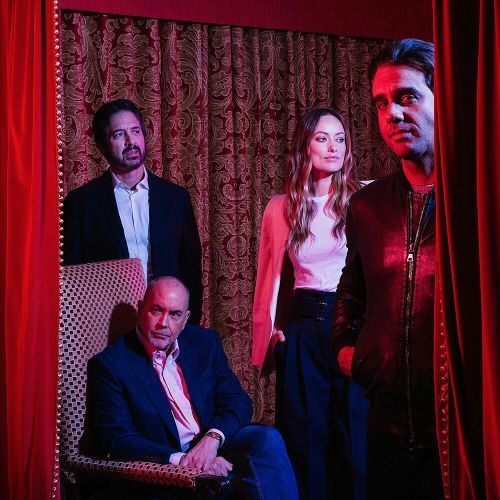 @brinsonbanks photographed Terence, seated, with Ray Romano, left, @oliviawilde and @bobby_cannavale. @vinyl debuts on February 14." By nytimes on Instagram.